According to the last U.S. Census, 80.7 percent of this County’s population live in urban areas. As Americans, many of us love the energy of a big city; the abundance and variety of restaurants, jobs, stores, and even people. New research from the University of Sydney suggests, that we’re not the only ones who prefer city living. Spiders that live in urban areas are showing to be healthier, and even more fertile. A new study suggests that spiders in the city seem to thrive in comparison to their counterparts in more rural areas. Australian scientists examined golden orb weaver spiders living in cities near the coast, and discovered that these spiders grow larger and reproduce more frequently in urban city environments. What’s even more fascinating is that female orb weaver spiders living in the city have bigger ovaries for hosting bigger eggs, and lots more of them. This increases the success of producing more, and healthier, offspring. Cities are warmer. With all the asphalt and concrete within a city, it’s scientifically proven that they tend to be warmer. Asphalt and concrete have the ability to absorb and retain the heat from the sun more effectively. In these higher temperature areas, the spiders have more energy to put toward feeding and reproduction. Urban affluence. One thing scientists found fascinating is that the more upscale a neighborhood, the more the spiders thrived. These more affluent areas, that had city parks and suburbs, were better taken care of. These areas had healthier patches of vegetation which increased the abundance of prey. More food equates to healthier, fatter spiders. Cities have more artificial lights. Artificial lights attract bugs. Anybody with a porch light can attest to that. City lights attract more bugs for spiders to feast on in a concentrated area. Less competition. Spiders found in rural areas tend to build larger webs. 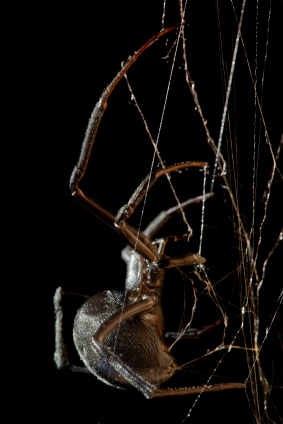 This allows for other spider species to zip in and steal and captured insect more easily. In cities, you don’t see this thievery as often because the thieves have fewer places to hide.